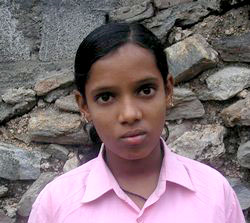 I am 13 years old and I am from the Arunthathiyar community. I study in a government middle school at Vilankurichi. For the past few years the teachers made me and the other 14 Arunthathiyar students clean the toilets. I told Ms. Chitra and Mr. Raja who work with Vizhudugal (Arunthathiyar activist group) about it. They said that we should not be cleaning the toilets and they came and talked to our teacher and the headmistress. We thought the problem would stop and I told the others not to clean the toilets. But both the teacher and the headmistress shouted at us using very bad words and beat us. The following day we did not clean the toilets either. Again we were beaten and all 15 of us were sent out of the school. A big crowd made the Kovilpalayam police register a case under the Prevention of Atrocity Act. For a week nothing happened and therefore Vizhudugal organised a demonstration. We went with our parents and others and shouted slogans in front of the office of the Collector (a senior government official) at Coimbatore. Only then the teacher and the headmistress were suspended and transferred. We were taken back to school and all of us are still studying there and we do not have to clean the toilets anymore. I am happy that my refusing to clean the toilets helped, but this change only took place because all of us – the students, our parents and Vizhudugal – were united.